Dr. Lilit Avetisyan MD, PhD, presented the International Health Regulations and the process of their implementation in Armenia during the Public Health Seminar Series of the AUA College of Health Sciences on January 12, 2011. 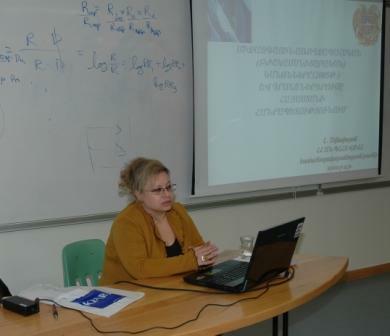 Dr. Avetisyan is a leading epidemiologist in the Ministry of Health of the Republic of Armenia. She is closely involved in health policy making and implementation in the country. Dr. Avetisyan is the Head of the Department of Communicable and Non-communicable Disease Epidemiology at the State Hygiene and Anti-epidemic Inspectorate of the Ministry of Health. AUA students, graduates, research staff, faculty, MOH representatives, and other health professionals attended the public seminar.